I never imagined what it would be like to have a little girl. When I was pregnant the first time 9 years ago I knew from the minute I got pregnant it was a boy – not because we had a sonogram to tell us – and not because my belly looked like a boy – but because I just knew that I would be a boy mommy. I wasn’t very girly. I don’t like to shop (insert gasp here); I don’t like shoes or purses, and I never played with Barbie. I mean I’m not a tomboy since I never really took to sports – but I’m more of a pragmatic girl. The only two girly things about me is the long, curly hair and my love of make up. Last June, as they cut me open to pull out my baby, and they told me it’s a girl – I was suddenly flooded with images of pink frillyness. I was sure that MY GIRL would not be a girly girl. She would wear cool clothes and never, ever play with Barbie. I mean, how could she – she was MY daughter. But it’s a daily amazement how much the girl transforms me. I like to dress her up, unlike the dolls with which I never played. A “little Galochka,” my parents call her sometimes – even though I look and see her daddy looking back at me. My cousin suggested I make some headbands myself – and I probably will – but in the meantime, I had a flashback to my first American barrettes. The plastic ones in various colors with a simple snap that held baby’s fine hair. Many of my friends didn’t remember them or didn’t know what I was referencing. Were these immigrant barrettes only? On a recent toothpaste run to the drug store, I passed by the hair aisle and Eureka – I found them. 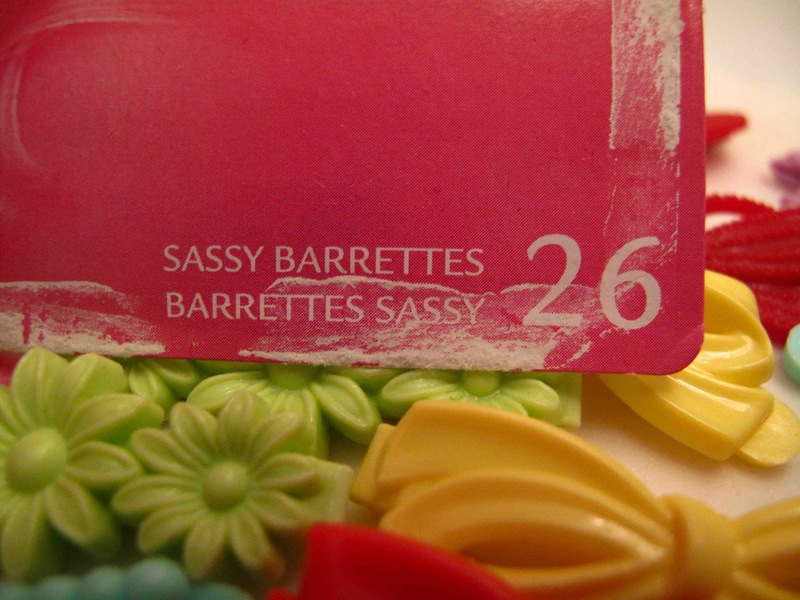 Goody Sassy Barrettes – for my sassy baby girl. They are perfect – for “piggies,” as I call them and a lovely side-swept bang look – and as a bonus, a box of 24 comes in every girly color. Goody, goody gumdrops! Ryukyusoul – I remember the pom poms too! Her hair is still too short for those but you know I'll be getting them when it's time for them! Of course I can't wait to go to the fashion district here in NYC and get tons of glittery and fabric flowers that I could just put on a headband! Previous Previous post: When Will the Facebook Twins Row, Row, Row Away?